Beautiful music creates a romantic and mysteriously exciting atmosphere. Christmas Delight comes with a nice decorated analog clock! Download and install magnificent animated screensaver! Christmas is one of the most wonderful holidays of the year. 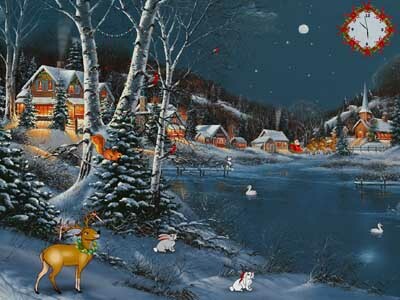 Christmas gives us a real treasure-hold of bright and positive emotions. Bringing everybody so much familiar feeling of holiday euphoria. Christmas Delight screensaver takes you on a wonderful journey to the magic woodland. You can feel the atmosphere of the festival, considering these winter scenes. And Christmas will come to you at any time of the year, even in summer! A patriotic screensaver for 4th of July with visuals and videos of USA. An appealing free screensaver. This has the altering images of American cityscapes with words flashing to promote the feeling of freedom and pride. With music. You will always know exact time with our free clock screensaver. Ambient people will certainly notice your screen saver! Download and install it absolutely free. Just a couple of seconds and Dark Style screensaver is on your computer. Take a journey through a world of shapeshifting and shining crystals! You will experience a different world with strange and mystical morphing crystaline structures. Try Crystal morphs and start this magic journey now! The beauty of the morning fog in the rays of the rising sun is reflected in our new screensaver Sunrise Lake. The graphics is very realistic as if you are sitting on the bank of the lake and admire the sunrise. A screensaver LoveJackpot from a collection of new free screensavers from http://www.newfreescreensavers.com will create a festive mood in your heart. Download free screensavers. No spyware, no adware, virus-free.